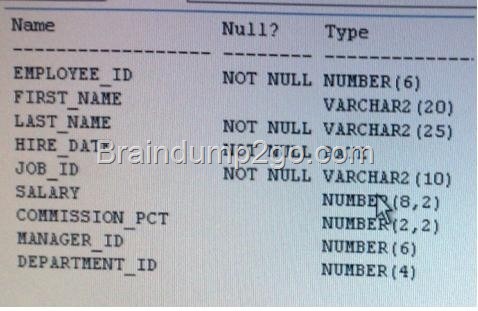 2014 Latest Oracle 1Z0-144 Exam Demo Free Download! In which of the following scenarios would you recommend using PL/SQL records? D. It gives an error because the variable name and column name are the same in the where clause of the select statement. 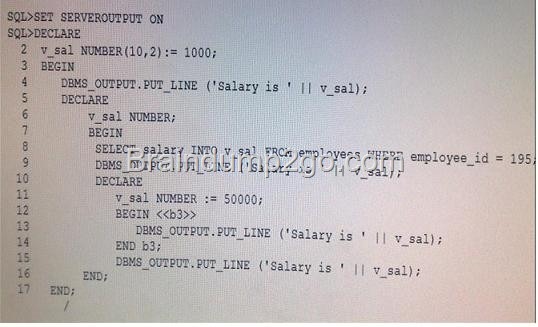 Identify open statement for opening the cursor that fetches the result as consisting of employees with JOB_ID as `ST_CLERK’ and salary greater than 3000. The salary of EMPLOYEE_ID 195 is 2800. B. It gives an error because the same variable name cannot be used across all the nested blocks. A. The cursor needs to be closed after the iteration is complete. B. The implicit open, fetch, exit, and close of the cursor happen. C. The record type must be explicitly declared to control the loop. 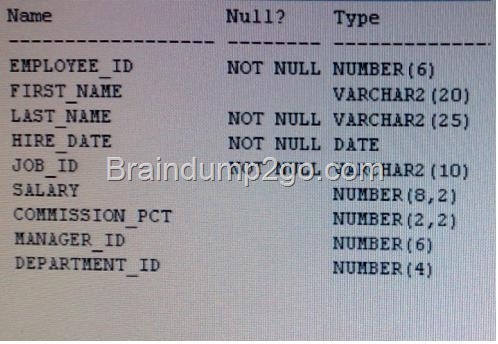 D. The PL/SQL creates a record variable with the fields corresponding to the columns of the cursor result set. Which statement is true about the execution of the code if the query in the PL/SQL block returns no rows? A. The program abruptly terminates and an exception is raised. B. The program executes successfully and the output is No ROWS_FOUND. C. The program executes successfully and the query fetches a null value in the V_LNAME variable. D. Program executes successfully, fetches a NULL value in the V_LNAME variable and an exception is raised. Procedure A was compiled at 8 AM. Procedure A was modified and recompiled at 9 AM. Remote procedure B was later modified and recompiled at 11 AM. The dependency mode is set to timestamp. Which statement correctly describes what happens when procedure A is invoked at 1 PM? A. Procedure A is invalidated and recompiled immediately. B. There is no effect on procedure A and it runs successfully. C. Procedure B is invalidated and recompiled again when invoked. 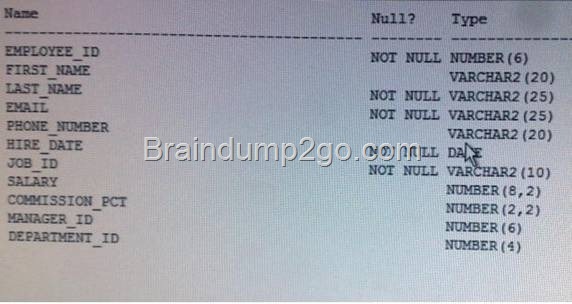 D. Procedure A is invalidated and recompiles when invoked the next time. Which statement is correct about the above snippets of code? A. The variable inherits only the data type from the CUT_NAME variable. B. The same_name variable inherits only the data type and default value from the CUT_NAME variable.